Santiago de Compostela, a UNESCO World Heritage Site since 1984 and Galicia’s greenest city, is a place of pilgrimage for many people – the discovery of the body of the Apostle James transformed this city into the most important focus of religious worship in Europe during the Middle Ages. These days, many thousands of people continue to walk the Camino de Santiago (the Way of St James) and while for some the religious significance may have diminished, for everyone there is the opportunity to explore the culture and history of this fascinating part of the Iberian Peninsula. Enjoying an Atlantic climate with mild temperatures in winter (rarely falling below 7ºC) and summer (rarely rising above 25ºC), Santiago de Compostela enjoys a strategic location at the heart of Galicia. That said, similarities with Ireland abound; fans of Irish traditional music will notice an uncanny resemblance between it and Galician traditional music. There’s that, and the fact that on average it rains at least one day out of every three. Just like home, then. What to do: A fair portion of people that arrive through the portals of Santiago de Compostela’s compact, unfussy airport are there to pay their respects to religious heritage and to connect in some way with the city’s place in Catholic history (in the Middle Ages, Santiago was the third most important city of pilgrimage after Jerusalem and Rome). To this end, a visit to the awe-inspiring Cathedral is a must – and not just for fervent pilgrims. The structure, which fronts the impressive Plaza del Obradoiro, takes pride of place as the focal point of the city, towering over everything and making it a directional reference point for the occasional confused walker. While the façade and the interior are stupendous works of art – and as such absolutely not to be missed – a tour of the cathedral roof offers equally amazing 360º views of the city skyline. Guided tours last about an hour and are highly recommended. You might think you’ll lose your bearings as you negotiate the maze-like network of narrow streets in the impressive Old Town part of the city, but investigating what’s around the corner will take up a reasonable amount of time. Many streets intersect onto a series of squares (Fonseca, San Martin, San Roque, Quintana), while you’ll never be stuck for something to do if you investigate the Old Town’s three main shopping streets of Rúa do Franco, Rúa do Vilar and Rúa Nova as well as all the narrow, intersecting ones. 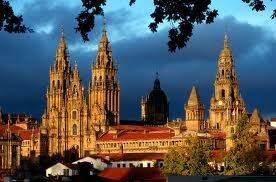 Should you wish to venture outside Santiago de Compostela, there are several excursions you can choose. Nearby towns and cities include Padrón, Noia, A Coruña, Vigo and Finisterre y Costa do Morte. All of these excursions can be booked via Turismo de Santiago Main Office. Where to shop: It’s best to arrive with sensible expectations. If you’re the sort of person who wants a High Street shopping experience, then you have to question your motives in travelling to Santiago de Compostela in the first place. It’s a compact city with all that that implies, so yes, it does have the likes of Zara and Pull & Bear (Spanish staples both), but no, it doesn’t have the Spanish equivalent of Grafton Street. Shopping-wise, the city is divided into the areas of New Town and Old Town. The former has more than several that’ll-do-nicely shops - the aforementioned Zara (Rúa de Montero Rios), lingerie shops Women’s Secret (Rúa do Doutor Teixeiro) and Intimissimi (Rúa do Xeneral Pardiñas), excellent cool clothes shops Bershka and Blanco (both on Rúa do Xeneral Pardiñas) and an excellent footwear shop, Calzados (Rúa de Montero Rios). The Old Town area is, by its intrinsic nature, far more interesting. 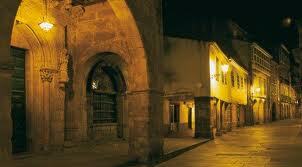 For starters, its street are narrow, cobbled and wind their way around, up, down, betwixt and between. You won’t get lost – this isn’t Venice – but in the locating of one street to the next you will most certainly discover the kinds of nook-and-cranny shops that clearly haven’t changed in many decades. Prepare to wander in and out of many of them as you examine their touristy wares; some are interchangeable, but some more (featuring various bookshops, clothes shops and street stalls, including a dainty hippie market on Rúa Nova) are worth a serious mooch around in. Where to eat/drink: It’s something of a cliché to say that you’re spoiled for choice, but you can’t get away from it – the Old Town area of Santiago de Compostela is full of options. One of the most obvious differences between dining out here and in, say, Dublin, is how cheap everything is. From water to wine, from cheerful cafés to places rather more swish and serious, the prices are reasonable. For instance, an afternoon snack of a large plate of calamari, half an oven-fresh baguette and a large cappuccino in Rhin Café (Rúa Nova) cost the princely sum of less than six euros. A small bottle of still water from any convenience-type shop costs in the region of 50c; a bottle of Estrella - Galician beer-with-bite – costs just over onen euro. And so on. So you don’t have to stretch your budgets – they’re stretched for you. Personal favourites include Casa Rosalia, Rúa do Franco, a free-for-all tapas joint that generates the sort of communal eating experience very few other restaurants can manage. Here was a series of culinary treats that included octopus sprinkled with paprika (in a word - yum), clams and mussels, fresh veg and whatever you’re having yourself. If you fancy something a tad more refined, then it has to be Restaurante Don Gaiferos (Rúa Nova 23). With its unprepossessing green entrance, tiled floors, bare stone walls, canopied ceilings and a fish menu to sink your teeth into (everything from barnacles to grouper, monkfish to lobster) this place has it all. Best place to sit and read the newspapers? Take a window seat at Café Casino (Rúa do Vilar, 35). 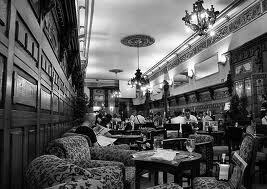 Established as a sanctuary since 1873 (initially just for men – check out the Casino’s old world smoking room), this has classically upholstered seats, allegorical scenes carved in chestnut wood, late 19th century chandeliers and the best selection of coffees and pastries in the city. Best place outside Santiago? Take a bow Pandemonium, Yayo Daporta, Cambados. Clean, straight lines, an amazing array of fish dishes and the region’s best wines? We reckon so.